A Chongqing-based Chinese industrial group is planning to invest $400 million in various projects in Hyderabad and elsewhere in Sindh. A memorandum of understanding (MoU) had already been signed in this regard, a representative of the Chongqing Federation of Industry and Commerce, Zhang Yang, told media persons here on Sunday. The MoU was signed between the federation and office-bearers of the Hyderabad Chamber of Commerce and Industry (HCCI) in China some time ago. Funds, Yang said at the HCCI, would be invested in steel, textile and clothing, real estate, agriculture, tourism, education and training, municipal and solid waste disposal sectors. “We have also declared Chongqing and Hyderabad as friendly cities,” he said. According to him, as many as 34 industries and investors from Chongqing would invest in joint ventures in Hyderabad and elsewhere in Sindh. “We are (already) maintaining a successful cooperation in the three-wheeled motorcycle industry … We will deepen this cooperation in the steel, textile, real estate and other sectors,” Yang said. He said Chongqing was home to China’s automobile and motorbike industry. Answering a question, he said that Hyderabad had been selected for investment in line with proposals submitted by the HCCI. “This MoU is part of the CPEC … (These) 34 Chinese companies will make direct investments in various sectors here,” former HCCI president Goharullah explained. HCCI’s vice-president Ziauddin, who signed the MoU, said the formal agreement would be inked between Hyderabad and Chongqing mayors in October this year. According to him, local companies would sign agreements when Chinese delegations visited Hyderabad soon. 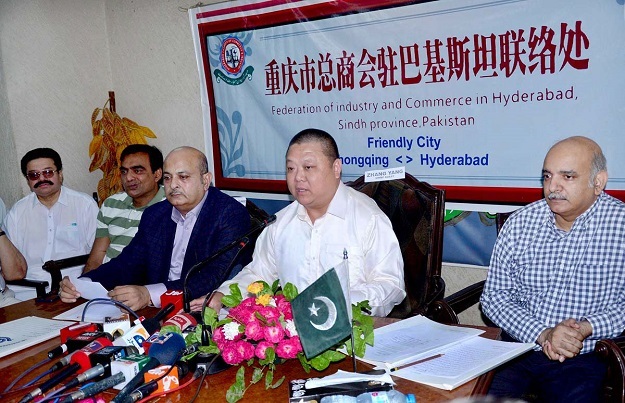 Ziauddin said that HCCI had requested the mayor of Hyderabad Syed Tayyab Hussain to accompany them when they visited China recently, but he could not accompany because of his busy schedule. A sub-office of the Chongqing federation had been established in Hyderabad’s SITE area, which would also be inaugurated in October this year. Meanwhile, the Fateh group of industries would launch its hybrid motorcycles under one of the first such joint ventures with a Chinese company.